2019: Hratt flýgur… Tvær vikur eru liðnar af nýja árinu, en ég hef lítið sinnt bloggi og þaðan af síður samfélagsmiðlum. En hér með óska ég óska öllum lesendum síðunnar gæfu og gengis á árinu – og bestu þakkir til hlutaðeigandi fyrir gefandi samskipti og samvinnu á árinu sem leið! Vonandi get ég sagt tíðindi af margvíslegum sköpunarverkunum á komandi vikum og mánuðum. Ljósmyndirnar voru teknar í skammdeginu núna í janúar. Veturinn virðist í hvorugan fótinn geta stigið, en kemur og fer – hrím breytist í titrandi tár og skammvinn dagsbirtan kallar fram tregablandnar skuggamyndir, – er nótt, er dagur? Svo hækkar sól á lofti. Gleðilegt ár! 2019: Time, time … I can’t believe that two weeks have already gone by since New Year. And I have not attended to my blog or site properly these last months – also consciously cut down my use of the overrated social media. Still, here I am! And a very happy, prosperous new year 2019 to you all: my readers and all the good people I have been in contact with and cooperated with last year! These two photos are taken earlier this month. Winter has been blowing hot and cold, mostly without snow, making the short days even darker. Rime and frost turn in to shivering drops of dew, and even the light is so fragile, it’s there and then it’s gone. But days are getting longer and the blue specks of sky are giving good promises. Happy 2019! Autumn is here in Iceland with chilly, starry nights. I think I have mentioned my passion for sky gazing and that goes for the night sky too. The northern lights were really nice this week so I tried my luck with the camera. Although I suffered from a bad cold I sneaked out and enjoyed the show. And I guess I would have stayed up half the night just admiring the stars and the dance of the auroras if not for the flu. The moon also peeked out from behind Mt. Skarðsheiði (below) and made scenery even more magical. ♦ Regnboginn: Síðustu daga hafa skúrir gengið á fjöllum og í gær buldu þrumur úr lofti. Fallegir regnbogar birtast svo á hverju kvöldi. En regnboganum verður örugglega flaggað í Reykjavík í dag. Njótið Gleðigöngunnar og hinsegin daga! Styðjum mannréttindabaráttuna og fögnum fjölbreytileikanum. ♦ Rainbow: Every evening the last days the rainbow has appeared after heavy rain showers in the mountains. I know the rainbow will be all over Reykjavík today and wish us all a merry Reykjavík Pride! Support and celebrate! ♦ Föstudagsmyndir: Það var kominn tími á sjálfsmynd! Ég velti því fyrir mér hvort ég eigi að leggja eitthvað spaklegt út frá myndinni: Er ég þá ekki nema skugginn af sjálfri mér? Varla. En ég hef reyndar þurft að styðja mig við veggi annað slagið. Ég hef líka verið önnum kafin við margvísleg bústörf og um það votta næstu tvær myndir fyrir neðan. ♦ Photo Friday: I have been too busy to post anything for couple of weeks, but this summer has sure been interesting so far. Since I am spending most of my time at the farm, the tasks are endless, big and small, hence the two next photos. But with nature so close at hand I can always take few minutes to gather colors, shapes and texture with my photo lens. Scroll down for more! Verk að vinna. Vélar og vinnuhanskar. Dögg. Í dag, 22. júlí, hefur lognið verið algert og rigningarúðinn situr í daggarperlum á hverju strái. Dew. Today the calm weather and the fine rain leaves every straw with drops of dew. Smávinir fagrir. Gróðurinn á sólardegi 12. júlí: grasvíðir, mosasteinbrjótur og blóðberg. Small and beautiful. Below: Salix herbacea, Saxifraga hypnoides, Thymus praecox arcticus. Fjöll og fjarski. Enginn morgunn, ekkert kvöld er eins… og litbrigðin óteljandi: Borgarfjörður, Belgsholtsvík, Snæfellsnes, Skarðsheiði, Hafnarfjall, Ölver í júlí 2016. Colors of the sky. Below: The sky and the mountains surrounding the farm are ever-changing with the light and the weather. The fjord and the bay: Borgarfjörður, Belgsholtsvík; Snæfellsnes peninsula; Mt. Skarðsheiði, Hafnarfjall, Ölver. ♦ Föstudagsmyndir: Það jafnast ekkert á við þessa blöndu: ilm af nýslegnu grasi og fersku sjávarlofti. (Um loftgæði í Melasveit mætti annars margt rita). Skýjabólstrar skreyttu svo loftin í gær – eins og yfir Skarðsheiði hér fyrir neðan. ♦ Photo Friday: The most important task in conventional farming in Iceland is still the haymaking during the summer months. I just love the smell of the newly cut grass mixed with fresh air from the sea! Below: clouds over Skarðsheiði Mt Range: Mt. Hafnarfjall and Mt. Ölver. ♦ Föstudagsmyndin: Svona er vorið – dálítið svart-hvítt á stundum. ♦ Friday Photo: Black and white spring photo. Snowy Mt. Skarðsheiði and horses at Melaleiti farm. ♦ Fjaran og fjöllin: Þrátt fyrir annir má ekki gleyma því að slæpast úti í náttúrunni. Rápa, horfa, hlusta. Hér bar fyrir augu Blálilju (Mertensia maritima) í fjörunni í Melaleiti. Og Snæfellsjökull er ævinlega jafn heillandi, sama hvernig á hann er litið. Ég tel víst að skarfurinn sem sat úti í Kotatanga sé sama sinnis. ♦ The mountains and the seashore: A stroll along the beach is always good for refreshing the mind and nourishing the soul. Especially at busy times. I enjoy this immensely at our farm Melaleiti. 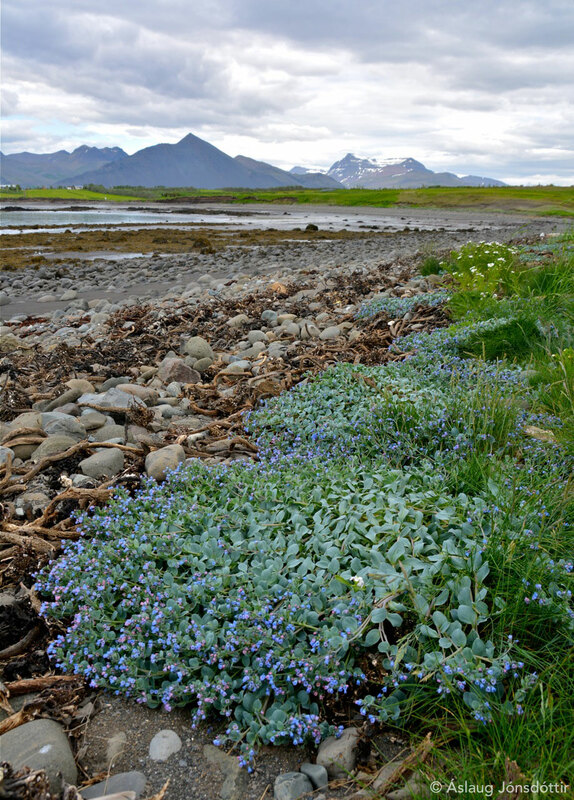 Above is Blálilja (Mertensia maritima) – Oysterleaf or Sea bluebells with Skarðsheiði mountain range in the back. 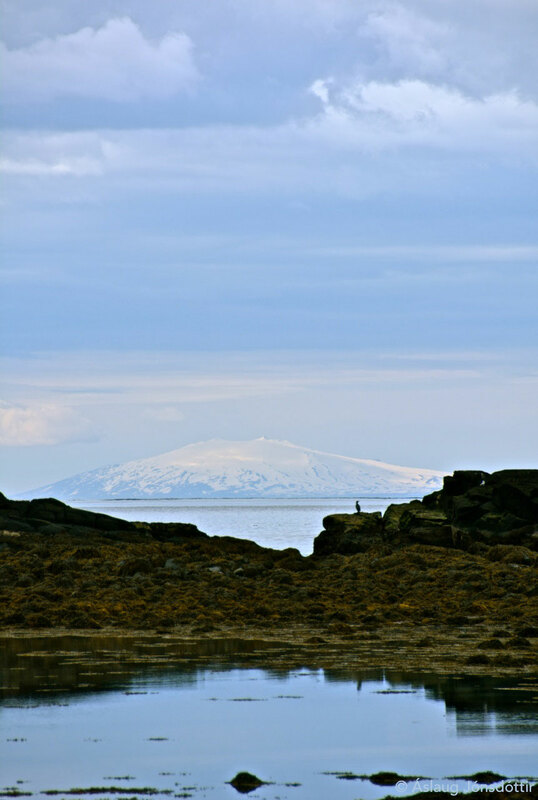 Below Snæfellsjökull glacier pictured over Kotatangi skerry with a sole cormorant (Phalacrocorax carbo).